It was a very hot day in July when I got the call from Sheree to rescue her beloved cat, Morris. 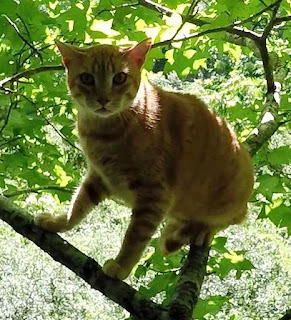 We don't know how long Morris had been stuck in the tree, because Sheree had been out of town for a while. We do know that he had been in the tree for at least a day and a half, because that is when Sheree returned home and found him missing. Morris is a 12 year old orange tabby, and he lives way out in the country with woods all around. 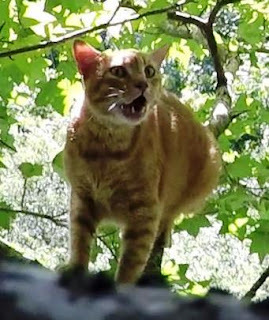 Fortunately, Sheree found him in the woods not far from home, but he was stuck about 30 feet high in a small tree. When I arrived, Sheree led me to the site by ducking and pushing our way through the undergrowth to the tree that Morris had selected. Privet grew all around the tree and blocked my view upward, so I spent some time cutting it back so that I would have enough room to work. By the time I was ready to begin setting up for the rescue, I was already soaking wet with sweat. I was hoping that Morris would be cooperative, because I did not have enough energy left for a long and difficult rescue. But Sheree told me that Morris normally runs from strangers, so I was not expecting him to be happy to see me. Morris walked out to the end of his short branch and waited for me. 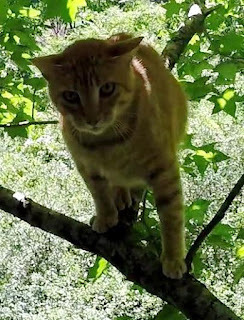 When I climbed up to his level, he did not show signs of severe stress, but he wasn't comfortable with me either. I decided to be patient with him because it appeared that he might warm up to me in time. He did get a little more comfortable, but not calm enough to have an appetite for the food I offered him. 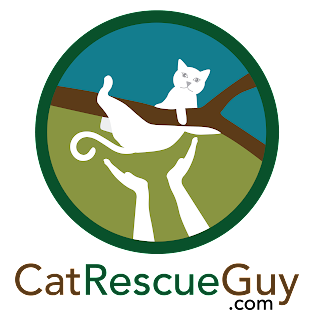 I gave him plenty of time and opportunity to learn to trust me, but he just could not relax enough for a cooperative rescue. Since he was within reach, I decided to see if he would let me pet him. I put on my gloved bag so that I would be ready to bag him if he allowed me to touch him. I reached out my hand and he was receptive. I gently touched the top of his neck and back, and he was comfortable with it. I rubbed his cheeks and neck with no complaint from Morris. I spent a little time getting him to relax with me, and then I scruffed him into the bag. I had a little trouble sealing up the bag because a stick had somehow gotten in the top of the bag. I had to fish it out before I could seal the top of the bag with Morris safely in it. I brought him down and handed him to Sheree. Sheree released him inside the house, and Morris ran to the back. He hid for a short while until he felt safe again, and then he came back out to eat and drink. Sheree is very happy to have her little boy back home again. Thunderstorms are very common in the hot afternoons during the summer time here, and I knew they were beginning to break out in scattered areas before I started the rescue. The weather was never threatening during the rescue, but when I left to drive home, I drove through some very hard downpours and lightning just a few miles down the road. I felt lucky to get Morris down before the weather would have forced me to stop.